Christopher Allen, The Weekend Australian , 'Walk the line', pg. 18-19, Canberra, 20 Sep 2008-21 Sep 2008, 18 (colour illus.). Review of Dobell Prize for Drawing. Virginia Grayson is pictured standing beside the work. Kim Christian, The Canberra Times , 'Dobell Prize quest draws to successful conclusion', pg. 9, Ainslie, 05 Sep 2008, 9 (illus.). Review of Dobell Prize for Drawing. Virginia Grayson is pictured standing beside the work. Elizabeth Fortescue, Daily Telegraph , 'Drawn to extend boundaries', pg. 36, Sydney, 08 Sep 2008, 36 (colour illus.). Review of Dobell Prize for Drawing. Virginia Grayson is pictured standing beside the work. Elizabeth Fortescue, Daily Telegraph , 'Drawn to self doubt', pg. 25, Sydney, 05 Sep 2008, 25 (colour illus.). Review of Dobell Prize for Drawing. Virginia Grayson is pictured standing beside the work. 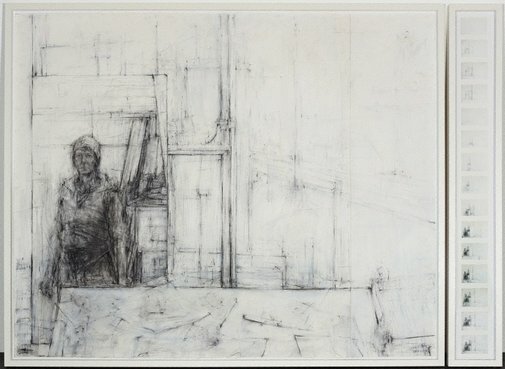 Hendrik Kolenberg, Contemporary Australian Drawing: 20 years of the Dobell Prize for Drawing , ‘Introduction’, pg. 6-14, Sydney, 2012, 8, 50, 51 (illus. ), 61. Janet McKenzie, Contemporary Australian drawing #1 , 'Virginia Grayson', pg. 88-89, South Yarra, 2012, 88, 89 (illus.). Corrie Perkin, The Australian , 'Art escapes to bin to win prize', pg. 3, Sydney, 05 Sep 2008, 3 (illus.). Review of Dobell Prize for Drawing. Virginia Grayson is pictured standing beside the work. Louise Schwartzkoff, The Sydney Morning Herald , 'Erasing grace: catch winner while you can', pg. 11, Sydney, 05 Sep 2008, 11 (colour illus.). Review of Dobell Prize for Drawing. Virginia Grayson is pictured standing beside the work. Louise Schwartzoff, Age , 'No conclusion but a happy ending for Dobell winner', pg. 10, Melbourne, 05 Sep 2008, 10 (illus.). Review of Dobell Prize for Drawing. Virginia Grayson is pictured standing beside the work. The Border mail. , 'Portrait a winner', pg. 2, Albury, 05 Sep 2008, 2 (illus.). Review of Dobell Prize for Drawing. Virginia Grayson is pictured standing beside the work. Illawarra mercury , 'Rookie's Dobell', pg. 9, New South Wales, 05 Sep 2008, 9. Dobell Prize for Drawing. Wagga Wagga Daily Advertiser , 'Life-drawing big winner', pg. 10, Wagga Wagga, 05 Sep 2008, 10 (illus., detail). Review of Dobell Prize for Drawing. Virginia Grayson is pictured standing beside the work. the (sydney) magazine , 'Dobell Prize for Drawing', Sydney, Sep 2008, unknown. The Australian financial review , 'What's on: Sydney', pg. 7, Sydney, 12 Sep 2008-14 Sep 2008, 7 (illus., detail). Virginia Grayson pictured standing in front of artwork.